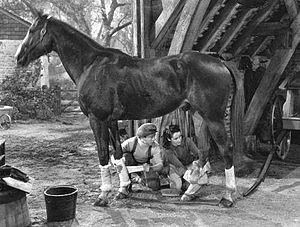 National Velvet is a 1944 American Technicolor sports film directed by Clarence Brown and based on the novel of the same name by Enid Bagnold, published in 1935. It stars Mickey Rooney, Donald Crisp, and a young Elizabeth Taylor. In 2003, National Velvet was selected for preservation in the United States National Film Registry by the Library of Congress as being "culturally, historically, or aesthetically significant." National Velvet is the story of a 12-year-old, horse-crazy girl, Velvet Brown (Elizabeth Taylor), who lives in the small town of Sewels in Sussex, England. She wins a spirited gelding in a raffle and decides to train him for the Grand National steeplechase. Velvet is aided by a penniless young drifter named Mi Taylor (Mickey Rooney), who discovered Mrs. Brown's name and address among his late father's effects, though he is unaware of why it was there. Hoping to profit from the association, Mi accepts an invitation to dinner and a night's lodging at the Browns' home, but Mrs. Brown is unwilling to allow Mi to trade on his father's good name and remains vague about their connection. Nevertheless, she convinces her husband (Donald Crisp) to hire Mi over his better judgment, and Mi is brought into the home as a hired hand. It is revealed that Mi's career as a jockey ended in a collision which resulted in another jockey's death. Mi has not held a job since, and now hates horses. Velvet names the horse she won, "The Pie", because his previous owner, Mr. Ede, called the troublesome gelding a pirate. Seeing Pie's natural talent, Velvet pleads with Mi to train him for the Grand National. Mi believes it a fool's errand, not because the horse lacks ability, but because they have no way to finance the effort. He makes his case to Mrs. Brown (Anne Revere), but she consents to Velvet's desire to train the horse. To cover the entrance fee and other costs, Mrs. Brown gives Velvet her prize money for swimming the English Channel. Velvet and Mi train the horse and enter him into the race. Mi and Velvet travel to the Grand National. Mi hires a professional jockey, but the night before the race, Velvet senses he lacks faith in the Pie and will lose. Velvet convinces Mi to dismiss the jockey, leaving them without a rider. That night, Mi overcomes his fear of riding and intends to race Pie himself. Instead, he discovers that Velvet has slipped on the jockey silks and intends to ride herself. Knowing the dangers, Mi unsuccessfully attempts to dissuade Velvet, who is determined to ride. As the race unfolds, Velvet and Pie clear all hurdles and win the race. Elated but exhausted, Velvet falls off her mount at the finish. After the track doctor discovers that Velvet is a girl, Velvet and Pie are disqualified. Velvet, who expected to be disqualified, only wanted to prove that Pie is a champion. Velvet becomes a media sensation and is offered large amounts of money to travel to Hollywood and be filmed with Pie. To her father's disappointment, Velvet tearfully refuses the offers, claiming that Pie would dislike being stared at. Velvet says that she raced Pie at the Grand National because he deserved a chance for greatness. Velvet chooses a normal life for her and her horse. At the close of the film, Mi, ready to resume his old life, takes his leave without bidding Velvet goodbye. Before he gets too far, Mrs. Brown gives Velvet permission to reveal her relationship with his father. Velvet gallops off on Pie and find Mi on the road. She tells him that his father was Mrs. Brown's coach as the first woman to swim the English Channel. The film differs from the book in a number of respects. For example, Velvet's horse in the book is a piebald, and thus is given the name "The Piebald" or "The Pie" for short. In the movie, Pie is a chestnut, and another explanation for his name was given. Velvet, in the book, is a sickly child who is given to great imagination and spirit; her father is stern and given to anger, but the mother is stronger still and stands up to him . Since her days as a swimmer she has become a large woman, and weighs 16 stone—224 pounds (102 kg) at the time of the story, and warns Velvet never to allow herself to be burdened by weight. In the book Mr. and Mrs. Brown also have a 15-year-old daughter named Meredith, in addition to Edwina, Malvolia, Velvet, and Donald. The Meredith character does not appear in the movie. Terry Kilburn as Theodore "Ted"
Alec Craig as Timothy "Tim"
Lansbury and Kilburn are the last surviving primary cast members. An 18-year-old Gene Tierney, who was then appearing on Broadway, was offered the role of Velvet Brown in 1939. Production was delayed, however, so Tierney returned to Broadway. Much of the film was shot in Pebble Beach, California, with the most-scenic views on the Pebble Beach Golf Links (with golf holes visible in the background). Elizabeth Taylor was given "The Pie" as a birthday gift after filming was over. This was the first of two films casting Elizabeth Taylor and Anne Revere. The other film, A Place in the Sun, featured Revere as the mother of Taylor's love interest, played by Montgomery Clift. In that film, however, the two actresses never shared the screen with each other in any scene. Mickey Rooney's scenes were shot first in one month allotted by the US Army before Rooney was inducted in June 1944. National Velvet currently holds a 100% 'Fresh' rating on Rotten Tomatoes. It was very successful at the box office earning $3,678,000 in the US and Canada and $2,162,000 elsewhere resulting in a profit of $785,000. National Velvet was dramatized as a one-hour radio play on the February 3, 1947 broadcast of Lux Radio Theater, with Elizabeth Taylor, Mickey Rooney, Donald Crisp and Janice Scott. In 1960, the film was adapted into television series which aired on NBC. In 1978, a sequel, International Velvet, was released. The film stars Tatum O'Neal, Christopher Plummer, Anthony Hopkins, and Nanette Newman, who plays Velvet Brown as an adult. After the events of "National Velvet" Donald got married, had a daughter named Sarah Velvet Brown, and moved from England to Cave Creek, Arizona. Sarah comes to live with Velvet and her boyfriend John after Donald and his wife die from their injuries in a car accident. Elizabeth Taylor did not reprise her role as Velvet in the sequel. ^ Variety film review; December 6, 1944, page 14. ^ Harrison's Reports film review; December 9, 1944, page 199. ^ Eagan, Daniel (2010). America's film legacy : the authoritative guide to the landmark movies in the National Film Registry ([Online-Ausg.]. ed.). New York: Continuum. p. 380. ISBN 978-0826429773. ^ "Monterey Movie Tours!". Monterey Movie Tours!. 2003-08-10. Retrieved 2016-10-26. ^ "Rooney, Mickey, Pfc Deceased". army.togetherweserved.com. Retrieved August 9, 2017. ^ "NY Times: National Velvet". NY Times. Retrieved 2008-12-20. 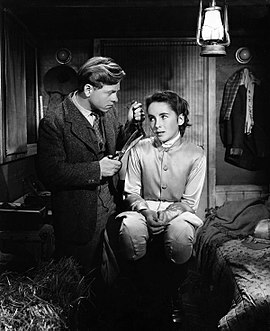 Wikimedia Commons has media related to National Velvet (film). This page was last edited on 22 March 2019, at 04:27 (UTC).